Distillation is a chemical process where a mixture made of two or more liquids (called "components") with different boiling points can be separated from each other. The mixture is heated until one of the components boils (turns to a vapor). The vapor is then fed into a condenser, which cools the vapour and changes it back into a liquid that is called distillate'. What remains in the original container is called the "residue". 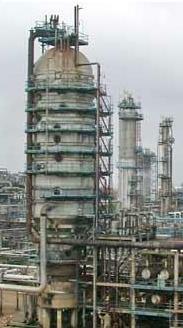 A fractionating column (that is a distillation column with more than two outlets) can be used to improve the separation. An oil refinery uses fractional distillation to purify crude oil so that it can become useful and can be used for various things. 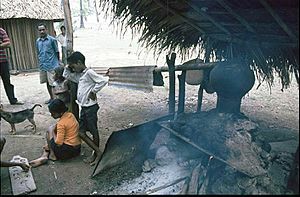 This has been used for a long time, to distil alcohol and produce distilled beverages. 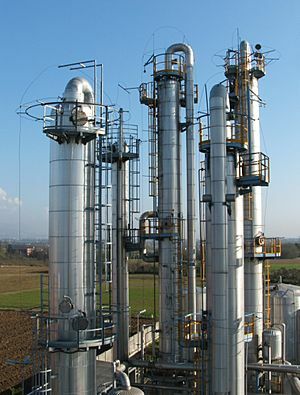 Distillation is a commonly used operation in many industries. 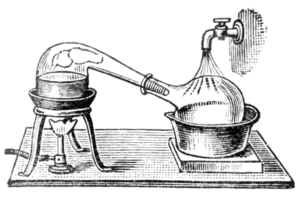 Distillation can be done anywhere, whether it's in a house or a laboratory, but in most countries it is illegal to distil alcohol without a license. Illegally distilled alcoholic drinks are called moonshine. Sometimes the desalination of water is called also "distillation", but this is a different process. In fact water distillation is used to separate a liquid (water) from solids (salts), instead the alcohol distillation is used to separate two liquids (alcohol and water). 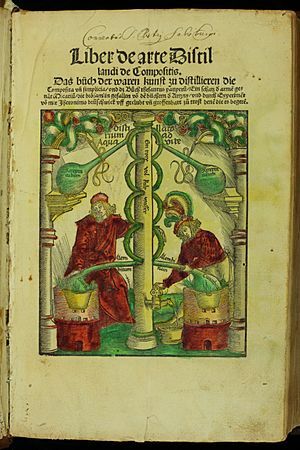 Evidence of distillation also comes from alchemists working in Alexandria, Roman Egypt, in the 1st century. Distilled water has been known since at least c. 200, when Alexander of Aphrodisias described the process. 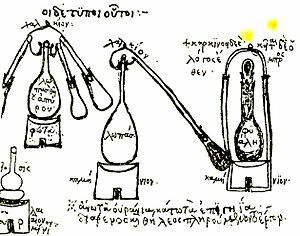 Work on distilling other liquids continued in early Byzantine Egypt, under Zosimus of Panopolis in the 3rd century. Distillation in China could have begun during the Eastern Han dynasty (1st–2nd centuries), but the distillation of beverages began in the Jin (12th–13th centuries) and Southern Song (10th–13th centuries) dynasties according to archaeological evidence. Clear evidence of the distillation of alcohol comes from the Arab chemist Al-Kindi, in 9th-century Iraq. The process later spread to Italy, where it was described by the School of Salerno in the 12th century. 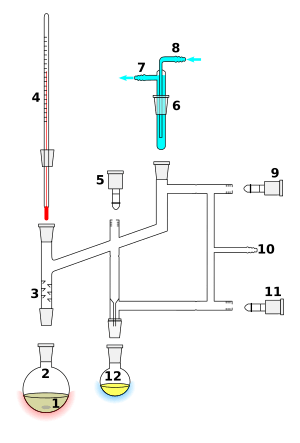 Fractional distillation was developed by Tadeo Alderotti in the 13th century. A still was found in an archaeological site in Qinglong, Hebei province, in China, dating to the 12th century. Distilled beverages were common during the Yuan dynasty (13th–14th centuries). With the emergence of chemical engineering as a discipline at the end of the 19th century, scientific rather than empirical methods could be applied. The developing petroleum industry in the early 20th century provided the impetus for the development of accurate design methods such as the McCabe–Thiele method and the Fenske equation. 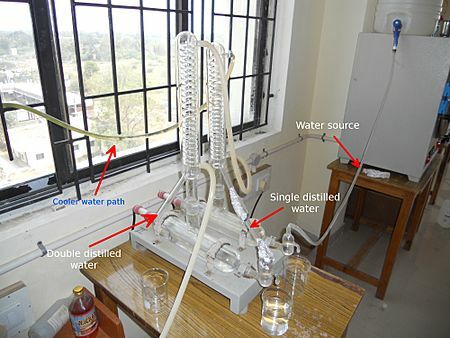 The availability of powerful computers has also allowed direct computer simulation of distillation columns. An implication of one boiling point is that lighter components never cleanly "boil first". At boiling point, all volatile components boil, but for a component, its percentage in the vapor is the same as its percentage of the total vapor pressure. Lighter components have a higher partial pressure and thus are concentrated in the vapor, but heavier volatile components also have a (smaller) partial pressure and necessarily evaporate also, albeit being less concentrated in the vapor. 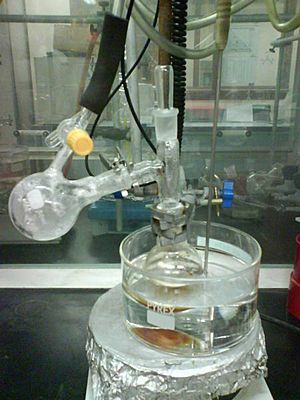 Indeed, batch distillation and fractionation succeed by varying the composition of the mixture. In batch distillation, the batch evaporates, which changes its composition; in fractionation, liquid higher in the fractionation column contains more lights and boils at lower temperatures. Therefore, starting from a given mixture, it appears to have a boiling range instead of a boiling point, although this is because its composition changes: each intermediate mixture has its own, singular boiling point. The idealized model is accurate in the case of chemically similar liquids, such as benzene and toluene. In other cases, severe deviations from Raoult's law and Dalton's law are observed, most famously in the mixture of ethanol and water. These compounds, when heated together, form an azeotrope, which is a composition with a boiling point higher or lower than the boiling point of each separate liquid. Virtually all liquids, when mixed and heated, will display azeotropic behaviour. Although there are computational methods that can be used to estimate the behavior of a mixture of arbitrary components, the only way to obtain accurate vapor–liquid equilibrium data is by measurement. Another factor in addition to the packing shape and surface area that affects the performance of random or structured packing is the liquid and vapor distribution entering the packed bed. The number of theoretical stages required to make a given separation is calculated using a specific vapor to liquid ratio. If the liquid and vapor are not evenly distributed across the superficial tower area as it enters the packed bed, the liquid to vapor ratio will not be correct in the packed bed and the required separation will not be achieved. The packing will appear to not be working properly. The height equivalent to a theoretical plate (HETP) will be greater than expected. The problem is not the packing itself but the mal-distribution of the fluids entering the packed bed. 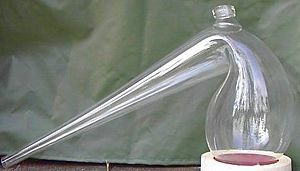 Liquid mal-distribution is more frequently the problem than vapor. The design of the liquid distributors used to introduce the feed and reflux to a packed bed is critical to making the packing perform to it maximum efficiency. Methods of evaluating the effectiveness of a liquid distributor to evenly distribute the liquid entering a packed bed can be found in references. Considerable work as been done on this topic by Fractionation Research, Inc. (commonly known as FRI). 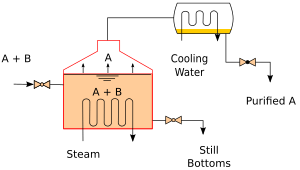 Distillation Facts for Kids. Kiddle Encyclopedia.